St. Patrick's Day is up there on my list of fave holidays. I mean really, it's awesome - green is my favorite color and I like beer, so done and done! And then there are the Irish Car-bombs. Now these are seriously fun. 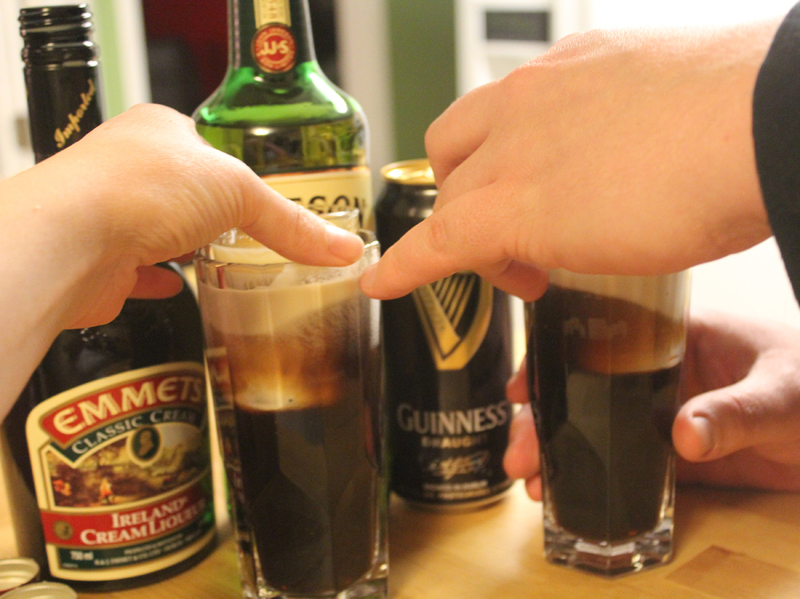 You drop a split shot of Jameson whiskey and Irish cream liqueur into a half pint of Guinness. And then you drink it fast. It's a once a year deal in our house and I look forward to it all year. Here is an Irish Car-bomb that I can have at least once more a year and stretch out the joy a bit! Preheat oven to 350 and line 2 cupcake tins with 24 regular-sized liners. I made the cupcakes a few hours before I started any frosting. I'll list the instructions in the order of steps I took. Combine flour, sugar, baking soda and salt in a large bowl. Whisk to combine and set aside. Combine eggs and sour cream in a stand mixer. Don't mix just set. Set aside. Measure out cocoa powder and then simmer Guinness and butter in a saucepan until butter melts and mixture is simmering. It needs to get hot, but not boiling. Whisk cocoa into butter and Guinness mixture. Pour into a new bowl to cool the mixture. In the stand mixer, mix sour cream and eggs. Add in cooled chocolate and Guinness mixture. Stir to just combine. Add flour and sugar mixture to chocolate mixture and mix very briefly with the stand mixer. Fold with a spatula if it needs a bit more stirring. Batter will be VERY loose and thin. It's OK, it cooks just fine! Let the cupcakes cool completely. Then start in on the frosting and filling. Chop up all of the chocolate - the smaller the pieces, the easier it will be to melt everything. Add the chocolate to the simmering cream and let it sit for a full minute. You'll see the chocolate become melty. Stir to combine - the chocolate should stir in easily. Stir in the whiskey and the butter and stir until everything is combined and smooth. Set the ganache aside. Stir it occasionally as it cools to room temp. It took mine about 30 minutes to cool off completely. I then let it sit for about an hour and it was fine. No, it was lovely - I dipped a strawberry in it to test it. In a mixing bowl with a hand mixer, whip the butter until it's light and fluffy. Start adding in the powdered sugar about 1/4 cup at a time. 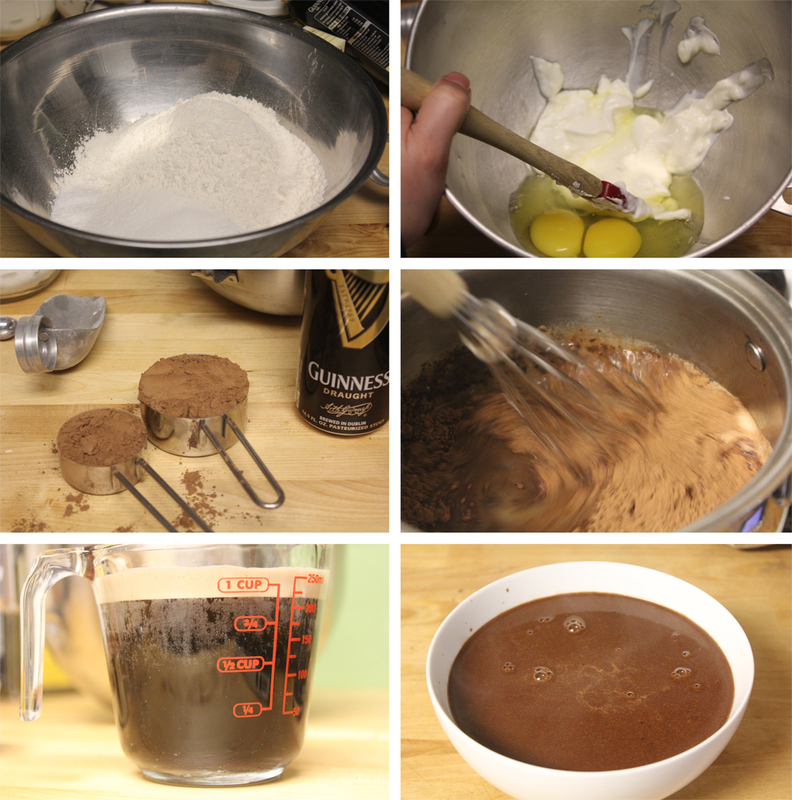 Add the Irish cream a tablespoon at a time when the butter and sugar mixture begins to form clumps. 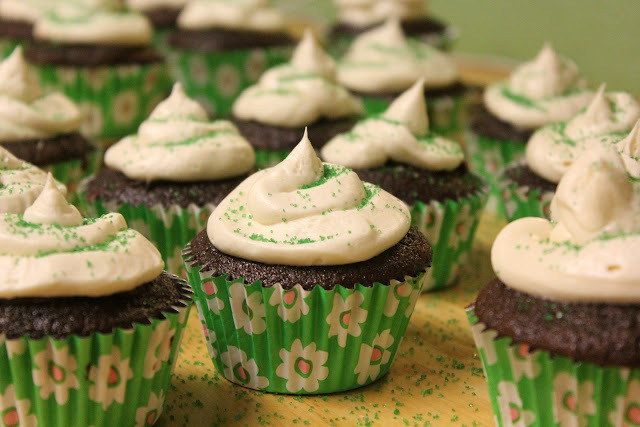 Keep adding sugar and Irish cream until the frosting is the consistency you like it. I used 3 1/2 cups of sugar and all of the liqueur. 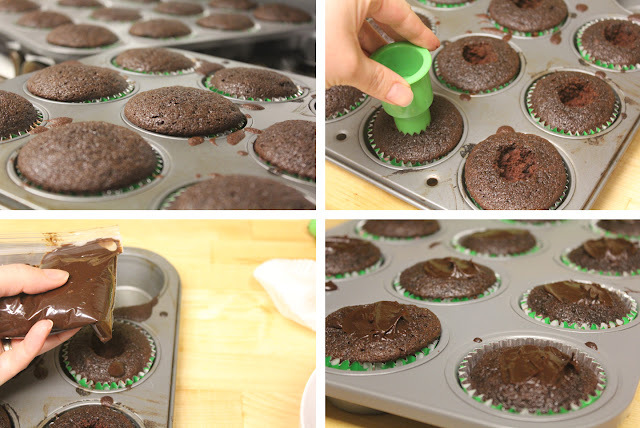 Now you can finally start making your cupcakes!! I have a fancy stocking-stuffer-gift tool that specifically cores out cupcakes, but a small knife or an apple corer would work just as well. Core out cupcakes, making sure not to cut through the bottom of the cupcakes. Pipe in ganache and pack it down with a butter knife. I used a ziplock back with a hole cut in the corner to do my piping. It worked great, except that I only have "snack size" ziplocks and re-filling a frosting filled ziplock baggie is messy. Pipe Irish cream frosting on top of the ganache filling. I used the same ziplock baggie technique. Sprinkle on sanding sugar and devour! The frosting tastes pretty boozy the day you make it. I made these Sunday and took them to work on Monday. By Monday the frosting had totally mellowed out and was amazing! The beer is adds depth to the chocolate cupcakes, but they do not taste beery at all. The ganache is just a tad spicy from the whiskey and it's just wonderful! If you're not a beer or booze fan, I think the alcohol cooks out of the cupcakes and the ganache doesn't need the whiskey at all to get the right consistency. And you could substitute milk for the Irish whiskey in the buttercream frosting to make the whole recipe suitable for non-drinkers. 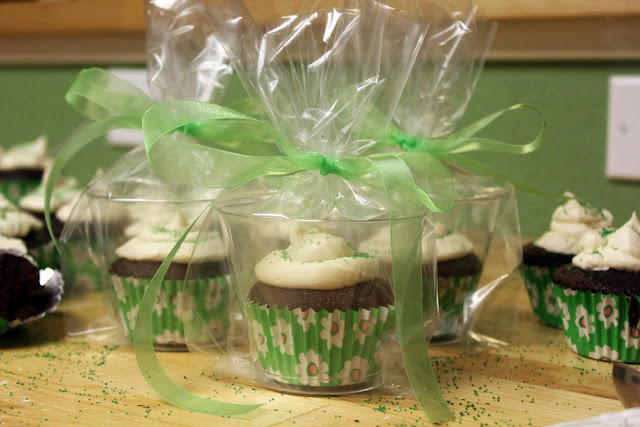 Here's a cute way to package up single cupcakes... it's just a plastic punch cup and a cellophane bag. Here are Car-bomb drinks going down... all the ingredients were open... can you blame us for jumping the gun on St. Patrick's Day?